With a big, bold preamp and the flexibility of variable Silk/Texture, Rupert Neve designed the 511 to combine classic sonics with 500-series value. 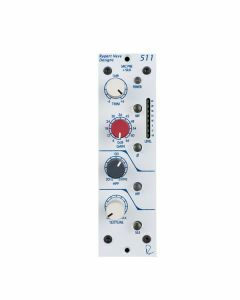 Incorporating the 517′s powerful preamp, the 5012′s universally useful sweepable high pass filter, and the transformer-saturating power of a variable silk circuit derived from our flagship Portico II Channel, the 511 is a Rupert Neve-designed micpre for the masses. One of the key developments in the 511 is the Red Silk / Texture control from the Portico II Channel. Building on the “Silk” mode found in the Portico Series mic pre-amplifiers, Texture is designed to adjust the actual amount of harmonic music content from the source material, in effect, providing wide range of tonal options for the preamplifier. Like the original Portico Silk, the Silk Red / Texture works by reducing negative feedback on the output transformer and adjusting the frequency response to more closely resemble Mr. Rupert Neve’s vintage designs. With the 511, the Texture control allows these techniques to be pushed further than previous designs, adding about 10 times the desirable THD of the original silk control at its maximum setting. With that said, we have taken great care to ensure that the musical integrity of source material itself will not be compromised by these harmonic controls (these are not to be confused with controls from other manufactures that may “incinerate”, “demolish” or “destroy” source material), and we believe they can be confidently utilized to fit the personality of any song, instrument or engineer. Much care was given in designing the 511 to produce as little noise and non-harmonic distortion as possible. Carefully implemented signal paths and Class A operation are a large part of the 511′s sweet, whisper quiet performance. For more information, go to Mr. Rupert Neve’s Design Notes. Engages phantom power on the microphone input, as supplied by the 500 series rack. Pushing the Silk button engages the red Silk circuit, which reduces the negative feedback on the output transformer, adding harmonic content as the texture is increased. Red Silk accentuates the saturation in the mid and high frequencies, similar to that of the red silk mode on the Portico II Channel. By manipulating the Texture control, the amount of Silk can be changed from essentially absent, to roughly 10 times the amount of coloration / distortion found in Silk from the original Portico Series. With Silk / Texture engaged, the distortion characteristic and harmonic content of the unit are very reminiscent of many of Rupert’s class-A vintage designs. An Eight-segment LED bar-graph meter displays output level (pre-Silk). The color range proceeds from green for lower level signals, yellow for intermediate signals, and red for high levels. When the 511 is clipped, the highest red LED will hold longer depending on how far above the clip threshold the signal was. Gain Unity: up to +66dB in 6dB steps. Trim continuously adjustable from -6dB to +6dB. Phantom Power: Supplied by the 500 series rack power supply. Switch selectable on faceplate. High Pass Filter: Continuously variable swept frequency from 20Hz to 250Hz.